Newly updated with cute, colorful clip art! Happy Poetry Month! 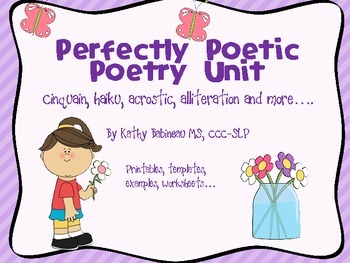 Poetry is an awesome medium for addressing a wide variety of speech/language goals and lessons. I like to use poetry in my speech therapy, but these lessons can also be easily adaptable to the classroom setting. *Descriptions and examples of cinquains, haikus, acrostics and autobiography poems in black/white for reproducibles and color for posting in your room. *Descriptions and examples of similes and alliteration in black/white for reproducibles and color for posting in your room. Clip art created by the 3-am teacher, whimsyworkshop, and traceeorman. Please copy for your own personal use. Please do not resell. Thanks for checking it out! Hope you like it!